Mobi Pizza Ovens Ltd is official distributor for Millberg Spitfire – professional gas burners for pizza ovens. 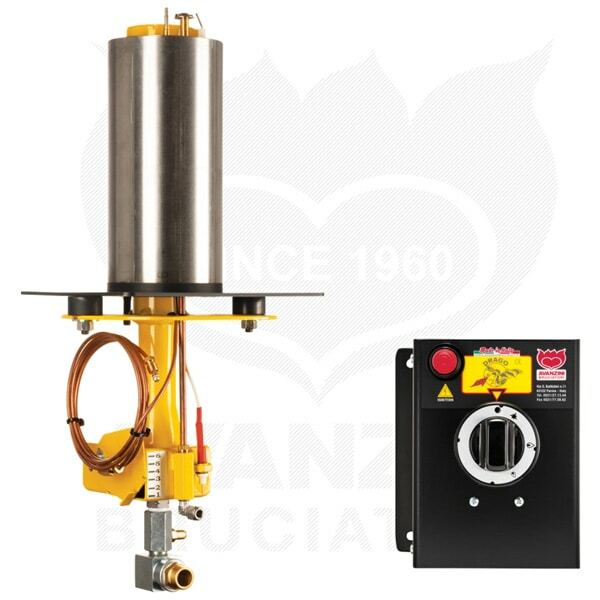 Most powerful, effective and economical gas burner for professional pizza ovens. A burner designed to replace wood in pizza ovens has become symbol of membership SPITFIRE which is not only a gas burner but a new way conceiving fire heat. Your pizza will be baked in a new environmental friendly way. Thanks for trusting us, your choice is an appreciated acknowledgement to the work we have been doing with passion for over 20 years. This MILLBERG burner -model SPITFIRE has been designed, manufactured in compliance with the strictest manufacturing protocols, to provide high quality performances, a friendly use, and excellent results; you will also be proud to say: I do not have a gas burner I have a SPITFIRE in my pizzeria! 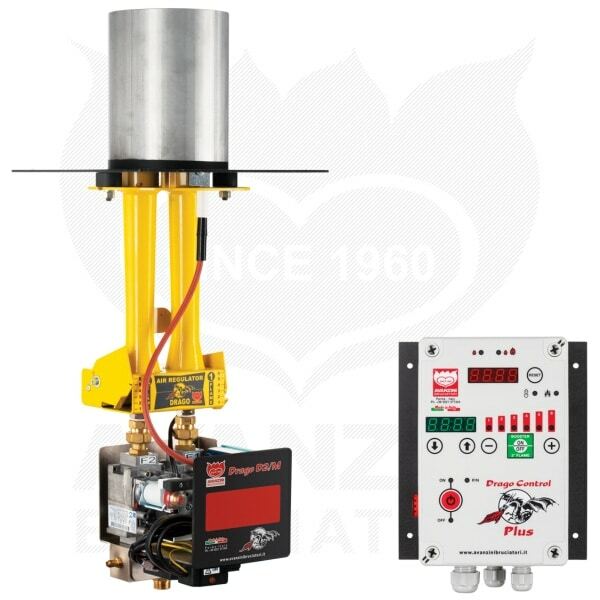 Spitfire New Generation is the innovative gas burner for inner use. It simulates and replaces wood combustion inside the pizza oven. The cooking plate is directly heated at the constant temperature of 400/450/500°C . 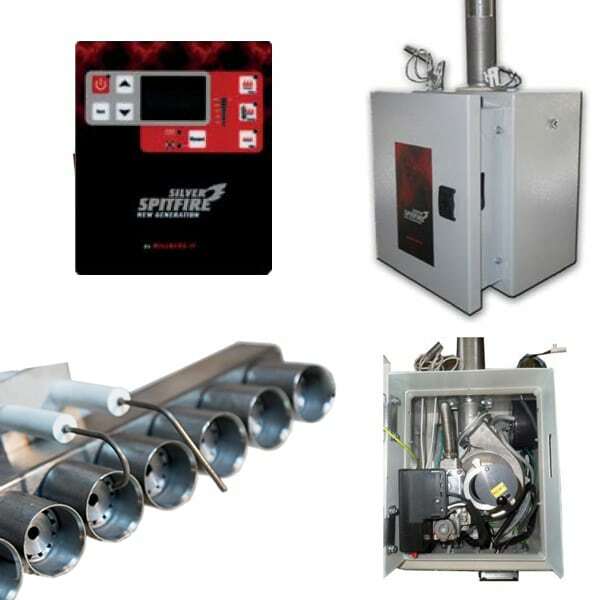 Constant heating ensures better productivity without altering the pizza quality your customers are used to. Spitfire enables to save energy from 20% to 60%when compared to wood, pellet or other gas burners. Emissions are lower, Spitfire does not produce soot and fumes emission is equal to the emissions of the latest generation boiler. Spitfire New Generation completely replaces wood, the oven is cleaner both inside and below. There is no need for wood piles, no need to clean the flue pipe and no risks of fire. Innovation Research, develop and grow: innovation is the heart of our business. For over 20 years we have been working with passion and determination in the field. Our SPITFIRE products are nowadays known for their quality worldwide. Quality. The quality of our products based on state of art technology stems from our experience from the skills of our people and of our high‐qualified, experienced technicians, capable to interpret the market trends. Safety. Besides being safe and user friendly, our products undergo several rigorous quality controls and meet the requirements of the most important international certification bodies. Reliability.Our products have been chosen by many customers for their high quality performances. The utmost reliability and serenity that only excellence can provide. Sustainability. SPITFIRE GOLD or SILVER burners completely replace wood as conventional fuel in ovens.Baking quality is higher and operating costs are lower. Our products enable to save Energy and have a very low environmental impact, they exploit natural and eco‐friendly resources. We believe it is very important to respect the environment and to return value to the world that surrounds us. 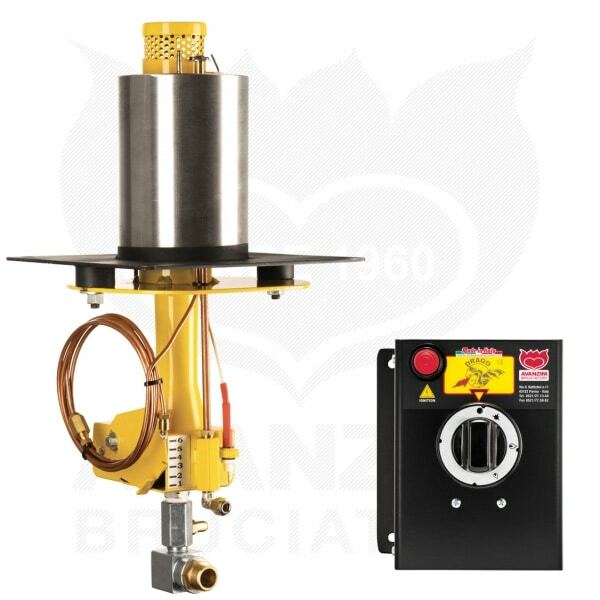 We can supply amazing Avanzini gas burners for all traditional and commercial ovens and tubular gas burners for stainless steel ovens. 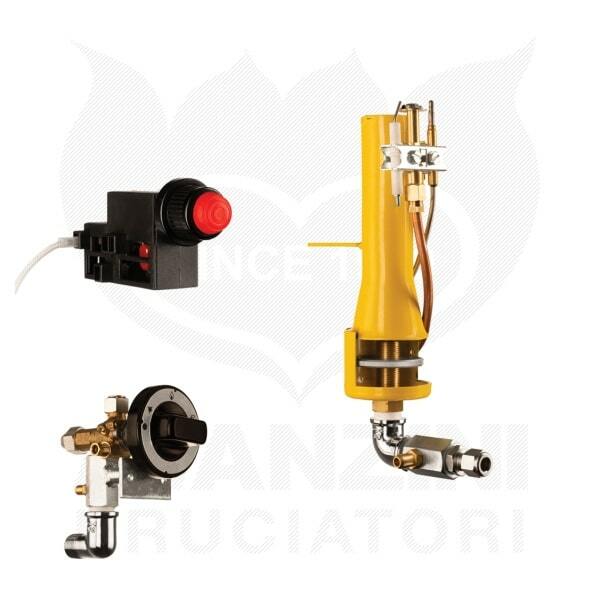 As we work closely with Avanzini Bruciatori — we can guarantee the best burner for oven of your choice or to supply best gas burner for your existing oven. Avanzini GAS burners are hand made and tailored for the specific oven they going to be installed into — this guarantees best oven performance. They are suitable for natural gas or LPG too. This is very important that the right burner is installed into your oven. (For example — burner length depends on oven floor thickness or burner output (power) depends on oven size. So these burners are priced individually. We offer manual controlled or digital thermostat controlled units. Below you will find only few examples with descriptions — please contact us for more details. We offer full range of Drago P, D, Six Avanzini Bruciatori burners. PLEASE BE AWARE THAT THERE ARE CHINESE COPIES ON THE MARKET LOOKING VERY SIMILAR TO ORIGINAL SO PLEASE BE CAREFUL. 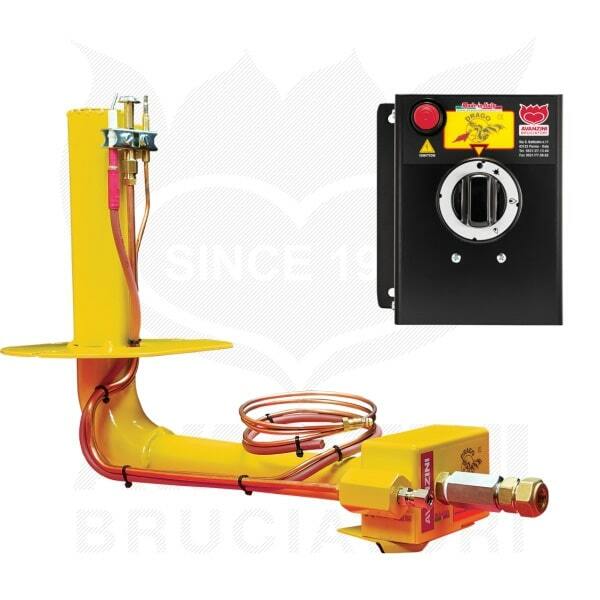 BURNERS FROM US ARE SUPPLIED WITH ORIGINAL DOCUMENTATION AND CERTIFICATION. EVERY AVANZINI BURNER HAS INDIVIDUAL SERIAL NUMBER. 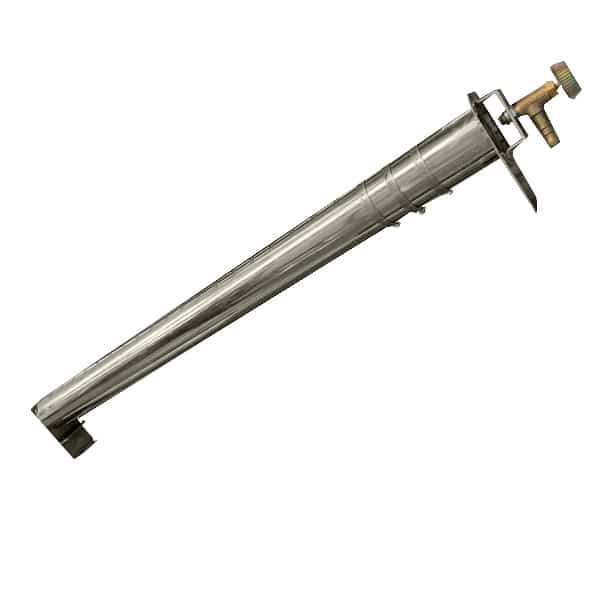 Tubular gas burners for stainless steel ovens are available from our online shop. Whatever oven type you operate – mobile, restaurant /commercial or garden — we can supply a dedicated gas burner for your existing oven or a new amazing pizza oven with a gas burner. Please note that our Mobile Pizza Oven are also available as “Drago edition” with a bespoke designed Avanzini gas burner. Important note! Most our ovens fitted with a gas system can also be fired with wood as normal wood fired pizza oven so you will have a fuel choice between Gas and Wood. PLEASE BE AWARE THAT THERE ARE CHINESE COPIES ON THE MARKET LOOKING VERY SIMILAR TO ORIGINAL SO PLEASE BE CAREFUL. 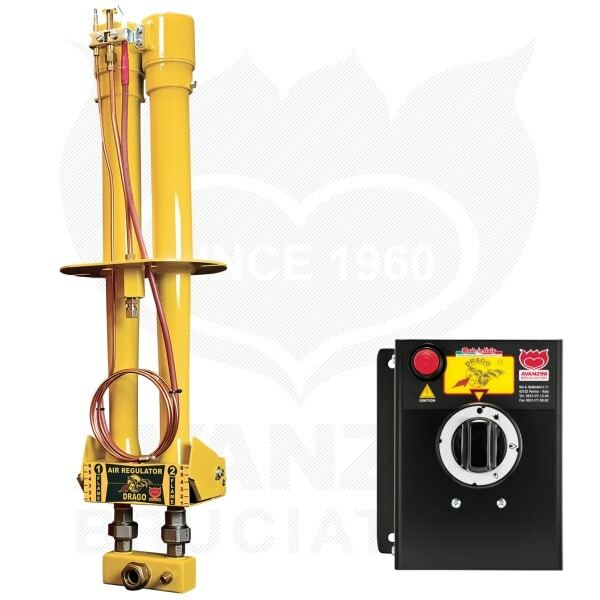 BURNERS FROM US ARE SUPPLIED WITH ORIGINAL DOCUMENTATION AND CERTIFICATION. Ideal for ovens with internal diameter 40 cm to 50 cm, the Drago P0 is an ultra‐silent atmospheric burner. The flame created by the special Venturi burner is very bright and replaces the characteristics of wood‐fired baking 100%. It also has the advantage of occupying very little space inside the oven, thus increasing the useful surface and managing the heat with extreme ease, simply by rotating a knob. The Drago P0 adapts perfectly to all types of ovens, both in terms of internal baking surface and in reference to the dome height, in fact the minimum quantity of heat can be controlled to maintain the oven temperature as well as the maximum quantity of heat to allow the oven to quickly reach the working temperature. Within this preset range, the flame control knob can be used to vary the amount of heat developed inside the oven, to reach and maintain the temperature required. To install, simply drill a Ø 80 mm hole in the baking floor. The Drago P0 can be installed in any environment, even outdoors, as it requires no electrical connection, it does not suffer from humidity and always guarantees maximum safety for the user, as certified by the IMQ tests performed. Indications for the position of the Drago burner inlet hole in the hotplate of the wood oven, view from above. The hole may be drilled either on the right or on the left. inlet hole, 5 cm (2”) from the ground. Install the gas ONOFF tap in a suitable position upstream. Remember to clean the flue to free it of any ash that might have been produced by the combustion of the wood. This model have manual thermostat. The gas supply must be delivered through a galvanized pipe Ø 1/2” or equivalent copper pipe, located at the burner inlet hole, 5 cm (2”) from the ground. Install the gas ONOFF tap in a suitable position upstream. Remember to clean the flue to free it of any ash that might have been produced by the combustion of the wood. This burner is designed specifically for gas powering typical wood‐burning ovens with indirect baking. To install, drill a Ø 110mm hole in the centre of the combustion chamber floor where the wood is placed. To save space in height, the Drago P1 Radial is built at an angle, and the flame control and control system is identical to the other Drago atmospheric burners. The flame created by the flamebreaker on the Drago P1 Radial is very low, as it develops around the circumference and therefore heats the ceiling of the refractory floor in the oven baking chamber in a uniform manner. The combustion products are then extracted through the chimney without ever coming into contact with the food being baked in the baking chamber. The gas supply must be delivered through a galvanized pipe Ø 1/2” or equivalent copper pipe, located at the burner inlet hole, 5 cm (2”) from the ground. Install the gas ON‐OFF tap in a suitable position upstream. This model have electronic thermostat. This model is tailor‐made to fit the total thickness of the oven floor, in which a 110 mm Ø hole must be drilled in order to insert the flange with thermal steel sleeve that protrudes 2–3 cm above the baking floor to protect the burner. 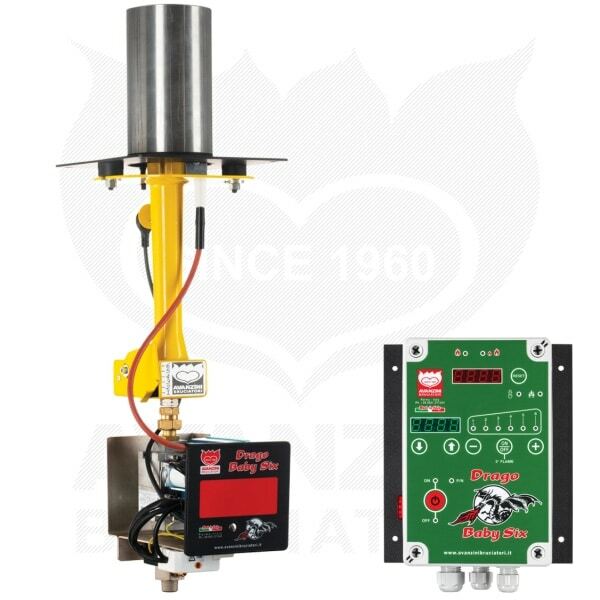 This single‐torch burner operates in either low or high flame and allows to adjust the high‐flame intensity to 6 different levels by operating the user‐friendly pushbutton panel featuring 6 LEDs. This option allows to handle the changing heat demands during the working day, simplifies the oven management and offers considerable fuel savings. The control panel is the Drago Baby SIX, a highly evolved control panel designed to manage temperatures in relation to the technical specifications of wood‐fired ovens. Simple and intuitive to use, not only does it prevent pizzas from being burned, but also guarantees consistent cooking throughout the working day and considerable fuel savings. The actual temperature inside the oven can be checked on the red display at any time, while the green display is used to check, and modify if needed, the desired cooking temperature in an extremely easy manner. The control panel allows to manually increase or decrease the intensity of the high flame to 6 different levels. The displays can show the temperature in C° or F°. The burner can be locked on low flame whatever the pre‐set desired cooking temperature. BOOSTER function allows to set a timer‐controlled operation in high flame for a certain number of minutes, with countdown for automatic switch‐off. The maximum cooking temperature can be set to over 500°C. All buttons are built into the control panel. DRAGO D1/S is a professional burner specifically designed to heat rotating oven floors. 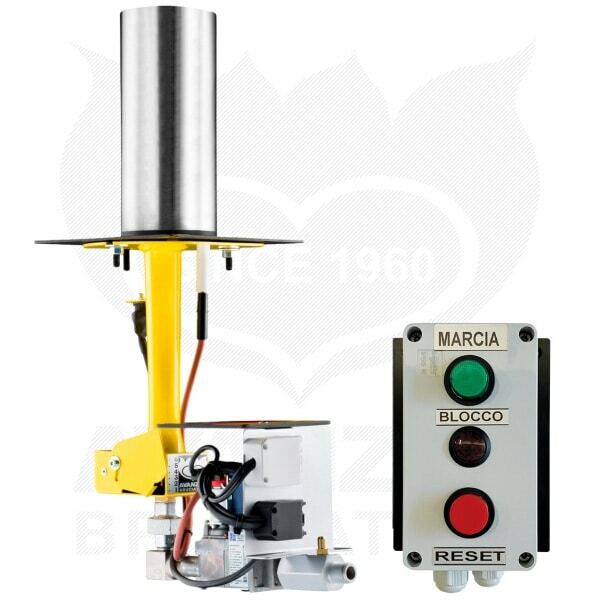 This model is equipped with an electronic burner control device and a gas control with automatic shut‐off valves and full electrical modulation installed in pizzerias with intensive production. The available control panels are either the simple ON/OFF one, or the manual control panel with flame height adjustment. This model is tailor‐made to fit the total thickness of the oven floor, in which a 150 mm Ø hole must be drilled in order to insert the flange with thermal steel sleeve that protrudes 2–3 cm above the baking floor to protect the burner. 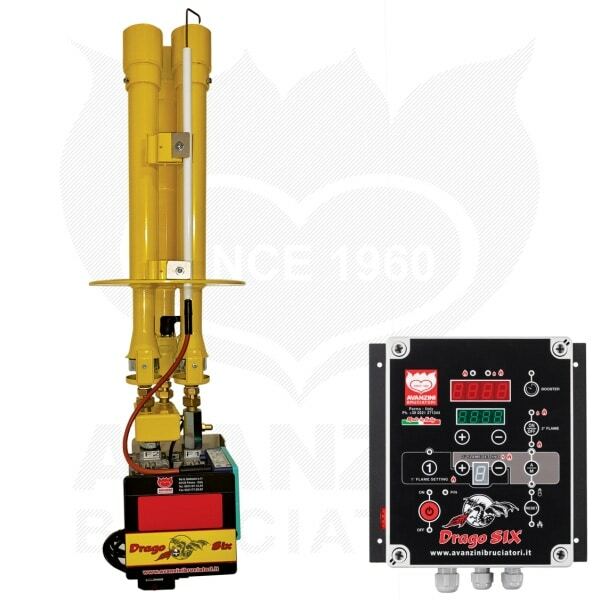 Drago D2 is equipped with safety devices that are certified worldwide: it has two gas controls with automatic shut‐off valves and an ionization‐based digital burner control device. This guarantees the best safety standards currently available on the market. Drago D2 has two torches and operates in either low or high flame. The regulation of combustive air is independent on each torch to ensure full brightness, thus simplifying the oven management to the full and offering considerable fuel savings. The control panel is the NEW Drago Control, a highly evolved control panel designed to manage temperatures in relation to the technical specifications of wood‐fired ovens. 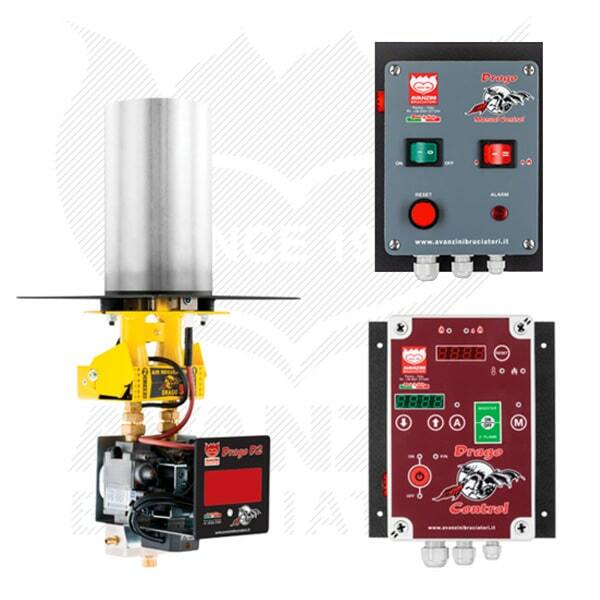 Simple and intuitive to use, not only does it prevent pizzas from being burned, but also guarantees consistent cooking throughout the working day and considerable fuel savings. The actual temperature inside the oven can be checked on the red display at any time, while the green display is used to check, and modify if needed, the desired cooking temperature in an extremely easy manner. BOOSTER function allows to set a timer‐controlled operation in high flame for a certain number of minutes, with countdown for automatic switch‐off: this is specifically designed for cooking Neapolitan‐style pizza as it gives the oven a boost for a set time prior to baking. 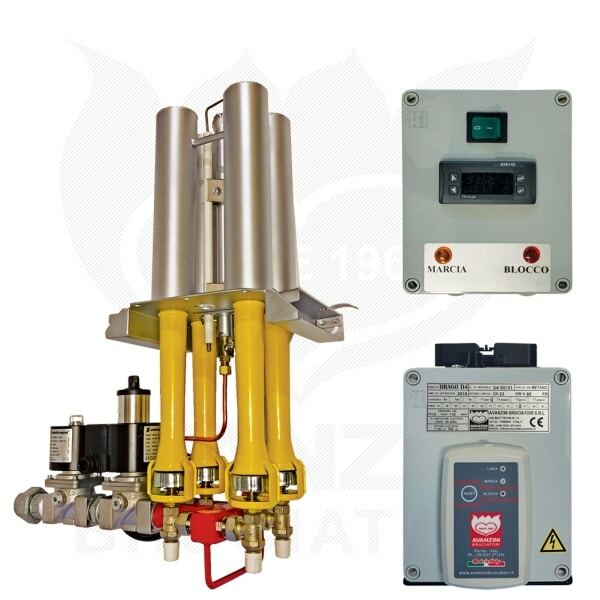 Drago D2/M is equipped with safety devices that are certified worldwide: it has two gas controls with automatic shut‐off valves, of which is on/off and the other has full electrical modulation, and an ionization‐based digital burner control device. This guarantees the best safety standards currently available on the market. Drago D2/M has two torches and is the evolution of the Drago D2. It operates in either low or high flame and the regulation of combustive air is independent on each torch to ensure full brightness, but it adds an extra feature: the intensity of the high flame can be set to 6 different levels of power by simply pressing on the user‐friendly pushbutton panel with 6 LEDs. This option allows to easily cope with the changing demand for heat during the working day, thus simplifying the oven management to the full and offering considerable fuel savings. The control panel is the NEW Drago Control PLUS, a highly evolved control panel designed to manage temperatures in relation to the technical specifications of wood‐fired ovens. Simple and intuitive to use, not only does it prevent pizzas from being burned, but also guarantees consistent cooking throughout the working day and considerable fuel savings. The actual temperature inside the oven can be checked on the red display at any time, while the green display is used to check, and modify if needed, the desired cooking temperature in an extremely easy manner. The high flame can be increased or decreased to 6 different levels of power. Drago Six is tailor‐made to fit the total thickness of the oven floor, in which a 150 mm Ø hole must be drilled in order to insert the flange with thermal steel sleeve that protrudes 2–3 cm above the baking floor to protect the burner. The new Drago Six is the highest technical expression of our range of atmospheric burners specific for heating pizza ovens. 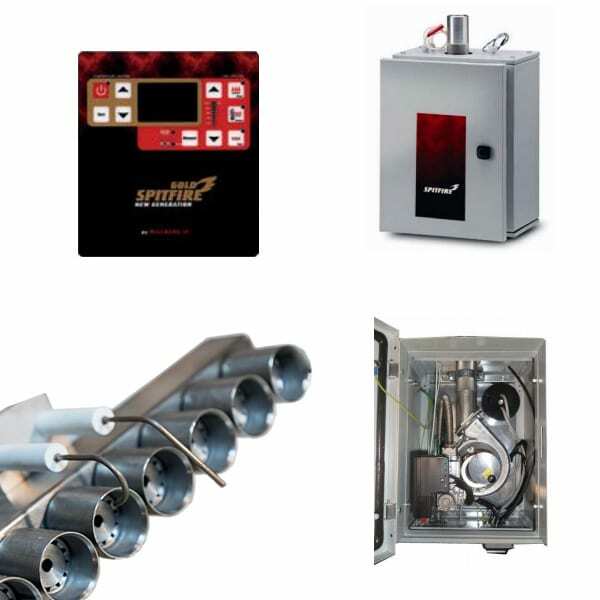 The gas safety and control devices installed are the best currently available on the market, and together with the specific electronic Drago Six control panel (which is the result of experience gained during thousands of successful installations) they guarantee the maximum ease of use and baking quality, allowing to adjust the Drago flame to any oven and any type of pizza. The Drago Six is the only burner on the market to offer pizza chefs the possibility to adjust both the high flame and the low flame (independently) to one of the 6 available levels, directly from the control panel. Drago D3/Six is tailor‐made to fit the total thickness of the oven floor, in which a 180 mm Ø hole (Drago D3/Six) must be drilled in order to insert the flange with thermal steel sleeve that protrudes 2–3 cm above the baking floor to protect the burner. The new Drago D3/Six is the highest technical expression of our range of atmospheric burners specific for heating pizza ovens. The gas safety and control devices installed are the best currently available on the market, and together with the specific electronic Drago Six control panel (which is the result of experience gained during thousands of successful installations) they guarantee the maximum ease of use and baking quality, allowing to adjust the Drago flame to any oven and any type of pizza. The Drago D3/Six is the only burner on the market to offer pizza chefs the possibility to adjust both the high flame and the low flame (independently) to one of the 6 available levels, directly from the control panel. It is tailor‐made to the height of the oven floor, in which a 200x200 mm hole must be drilled in order to insert the flange with thermal steel protective cap that protrudes 2–3 cm above the baking floor to protect the burner. 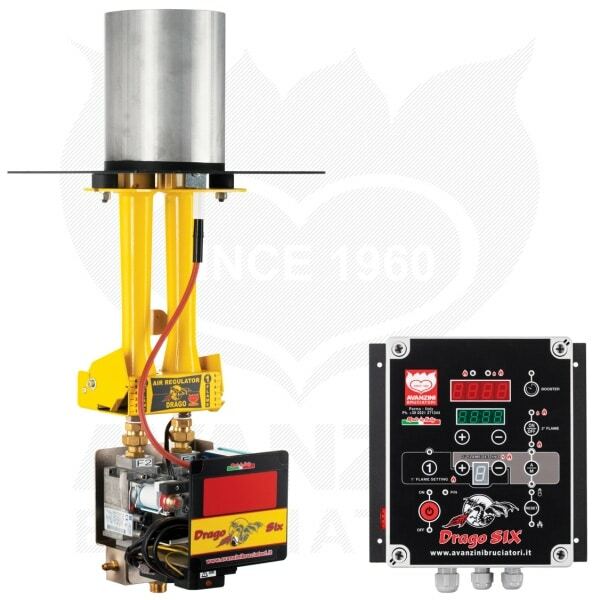 The Drago D4 is equipped with safety appliances that are certified worldwide: it has two on/off solenoid valves and a flame on/off and control unit which works on an ionisation principle, which directly ignites the pilot flame. The Drago D4 has four torches. The burner works in ON‐OFF mode and the combustion air control is independent on each torch to ensure full brightness, thus simplifying the oven management to the full and offering considerable fuel savings. The control panel has digital heat control and switches off the burner when the temperature setpoint is reached.